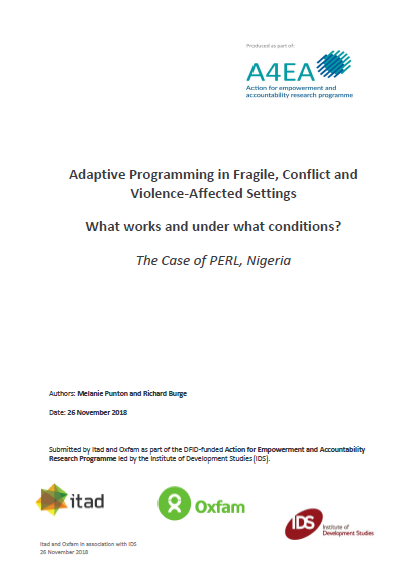 This case study examines adaptive approaches to aid programming in Nigeria, as part of the DFID-funded Action for Empowerment and Accountability (A4EA) research programme. It is the second in a series of three, focussing on DFID flagship projects to explore if and how adaptive approaches are particularly relevant and useful for promoting empowerment and accountability in fragile, conflict and violence-affected settings (FCVAS). The case study focuses on the £100 million Partnership to Engage, Reform and Learn (PERL) programme in Nigeria, which promotes better service delivery through bringing together government and citizens groups to collectively address governance challenges. We identify a range of lessons about working adaptively, drawing on a conceptual framework (the ‘adaptive triangle’) that looks at three types of adaptation – adaptive management, adaptive programming and adaptive delivery – and the interconnections and tensions between them. The first case study in the series is available here.